What is “logic?” Sounds stupid! Imagine what numbers you would find if you compared the states’ cost-of-living or regulatory levels or looked at the growth of the nation’s economy as a whole. It’s easy for hiring not to be affected drastically by an increase in minimum wage when NJ unemployment is higher than the national average and Pennsylvania average to begin with (when you’ve hit rock bottom, what is there to do but improve?) and is in the middle of a slow recovery beginning in 1992. The way I see it, Card & Krueger were going off of circumstantial evidence. There have been several studies conducted since then showing why their results were incorrect. One thing Card and Krueger did wrong, for example, was conduct informal surverys over the phone instead of looking at the data on the actual payroll records. You can read about that here. The reason I bring this up is that those studies will be mentioned again in this week’s discussion. Speaking of which, it’s time for round two! Fight! John, I want to highlight a comment you made in your initial argument about low wage workers– “They choose to work in sweatshops because hard labor for a dollar is better than starving to death.” I want you to really think hard about that statement. Is that the choice you are offering people? As opposed to what alternative? If there were a third option that’s better, workers would take that one instead. They work because having a choice between working and dying is better than not having a choice at all. Poverty is the natural state of man. When sweatshops allow workers to make money, it’s leaving them better off. It’s creating an opportunity that otherwise wouldn’t exist. Why do you think that that’s evil? What would you propose instead? Wait, don’t answer that. I know: raise the minimum wage, right? I mean, if African countries are poor, why don’t they just eliminate poverty by raising the MW? Problem solved! Really? That is not a choice John. That is no choice. 200 years ago European countries were just as poor and sick as Asian countries. Poverty has been around forever, but with the miracle of capitalism and the Industrial Revolution, European countries went from dirt poor to healthy and wealthy. That is the same opportunity being offered to third world countries now. “The key insight of Adam Smith’s Wealth of Nations is misleadingly simple: if an exchange between two parties is voluntary, it will not take place unless both believe they will benefit from it. Most economic fallacies derive from the neglect of this simple insight, from the tendency to assume that there is a fixed pie, that one party can gain only at the expense of another.” -Milton Friedman. Our GDP hasn’t always been $15 Trillion. 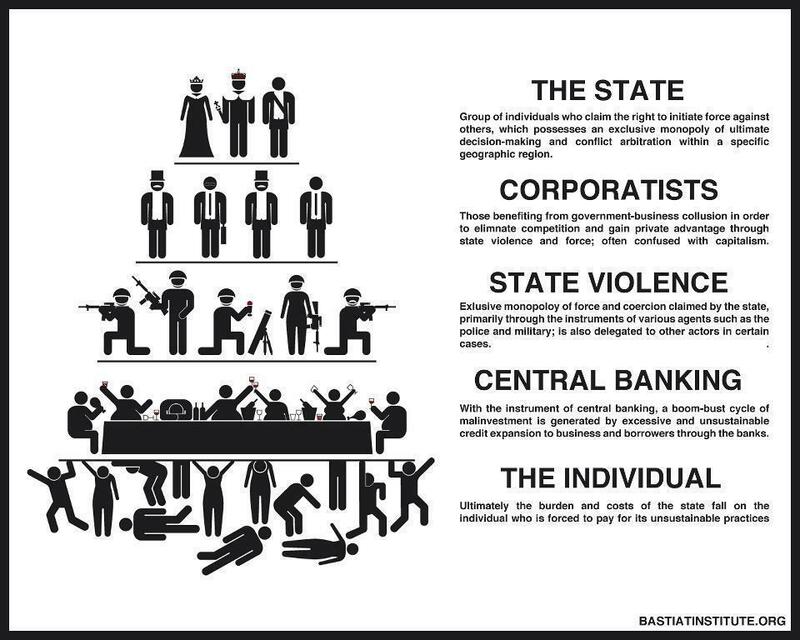 Capitalism creates wealth where it previously did not exist. When I hear statements like that, I can’t help but think of images like the one attached. It shows a kind of effusive indifference that, in the past, fueled the first great Progressive movement in America. The movement that fought unsanitary and inhumane working conditions present in the meat industry (as illustrated in the Sinclair’s Jungle) and other industries of the time. You say that competition will solve that…that businesses will get wise and offer better wages to attract more workers, you say? Well that didn’t happen in the very capitalistic America in the 1880’s to early 1900’s. 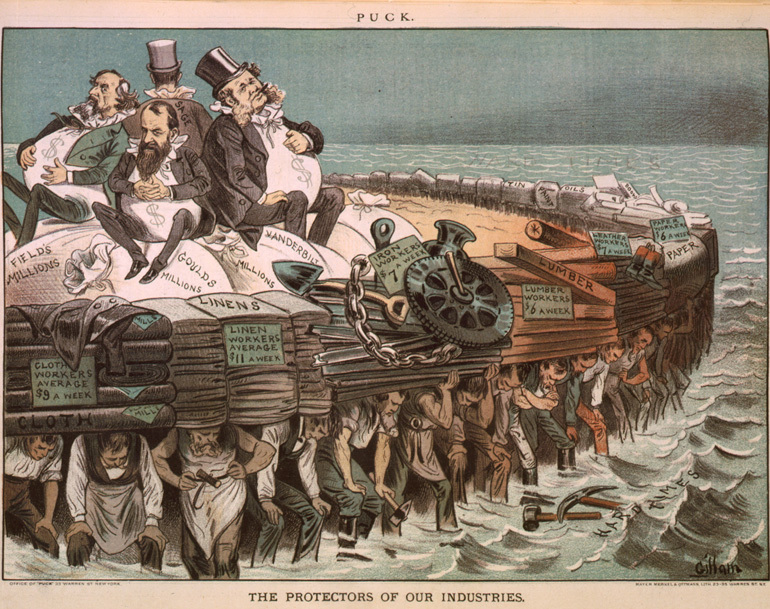 Businesses colluded together to form monopolies that could put wage freezes on employees. It caused untold hardships on families, and in the end produced the unions, and monopoly busting regulations of the government that eventually fixed the problem. So based on what math and logic is a maximum wage detrimental but a minimum wage beneficial? What hardships did it cause? If workers were making money from their jobs, it was better than not having a job and earning $0, wasn’t it? They weren’t losing money, they were earning money. I’m not saying this as to mean that life for people wasn’t hard in the 1890’s. It was extremely hard! But it was also hard for thousands of years before that. Also, I defy you to name a single monopoly that didn’t arise as a direct result of government intervention. The so-called “natural monopoly” is a myth. (https://mises.org/daily/5266) So the government created a problem and then fixed it. That’s about par for the course. It’s this same kind of intransigent thinking, John, that is giving rise to a second Progressive movement in this country. One I’m proud to say I support by the way. That movement is currently taking the form of shaming the major industries to do right by their workers. Plastering Walmart and Disney supply chain choices on the news and lobbying government is finally starting to have some effect on the Bangladesh linen industry. Shaming Apple has caused them to start looking seriously at the business practices at Foxconn. You say that if you don’t like Walmart’s employment approach, don’t shop there. I agree. We should vote with our pocket books and stop buying products from stores that place a toll on society.. and no John, that toll has not been primarily a higher standard of living or innovation. It has brought us sweat shops and child labor, and you should be truly thoughtful about your comment on child labor. It is only a cool, detached intellect that casually dismisses child labor as a force for good. Quite frankly, I’d rather be cool and detached while using facts and reason than to “feel” and be wrong like I used to when I was a statist. Don’t forget! I used to be a Republican/Democrat. I used to believe everything you believe now. I didn’t become a Libertarian until around 2013 when I finally learned to challenge my own beliefs. Who cares if they’re a think tank or not? What matters is whether the content is true or false. when you actually look it up, basically posts one blurb about one study that doesn’t give any figures or any context whatsoever—just a paper statement. If you dug a little deeper, you would see the conclusion of that report was “when perfectly enforced, (child labour) bans force employers to forgo the use of child labour….thus, when imperfectly enforced, bans may simply lower the wages that children are paid”. http://www.voxeu.org/article/why-do-bans-increase-child-labour. I’d expect a little better in your arguments. Erm… you’re kidding me, right? When has a ban ever in the history of creation been perfectly enforced? You might want to read the article you linked, just once more; only this time, read it word by word instead of line by line. I mean, I haven't lost my mind, right? It's the opposite of what the article actually says. 2. I hate to say this, but please stop quoting links to the Heritage Foundation. I normally don’t like to automatically reject a source out of hand, but Heritage is a conservative funded think tank that either produces or selects studies that promote their agenda. And you practically quote their arguments by rote. The link you site, though it does have one clearly unbiased paper from Texas A&M, most of its points including its salary wage increase data are based on one study by EPI , the Employment Policy Institute, which just so happens to be funded by lobbyists for the restaurant, hotel, and alcohol industries. Well excuse me. Would you perhaps like to send me a list of all the sources I’m not allowed to use? As I said before, what matters is whether or not the content is true and logically sound. Who cares whether they’re being paid or they have bias? The New York Times is strongly biased, but that doesn’t stop you from linking it. And in general, the article seems to miss the point…setting a minimum wage is not seeking to replace raises, only set a minimum cap to start with those raises. I would encourage expanding your sources of information to some less politically motivated organizations and go for more pure data. For instance, I like to get mine mostly from the common sources, like the Bureau of Labor Statistics. Say what you will, they have been collecting data on labor for decades and they are very unbiased. According to whom? The Bureau of Labor Statistics? I say that in jest, but it is still a good point. According to the BLS, http://www.bls.gov/cps/minwage2012tbls.htm#1 , employees of age 25 and older made up 50% of the minimum wage or less crowd, teenagers made up only 24% (sorry, earlier I said it was 12%, my bad). –PS you have to look at table 1 in the percent distribution for “At or below Minimum wage”. A quick aside, if you compare that 2012 report to the BLS report in 2002, http://www.google.com/url?sa=t&amp;rct=j&amp;q=&amp;esrc=s&amp;frm=1… , you’ll notice that the numbers of 25 and older workers receiving minimum wage or less went slightly up (about 3% increase) from 47% in 2002). 25 or older workers in MW jobs are typically not entering the workforce for the first time, or trying to train themselves up to move to a better paying job. Based on what facts? Considering that many workers in low-paying jobs have Bachelor’s degrees, I’d say that many of them went to school instead of working. Also, keep in mind that part-time jobs and seasonal employment count as “being in the job market previously” for the purpose of statistics, but don’t carry the same weight as working full time for several years straight when it comes to getting raises and promotions. Most of them are there because the economy doesn’t have better jobs for them and they have to settle (for now). And with long term employment of most workers at an all time high since this recession started, those people can’t afford to wait for another job to pay at least a better minimum wage. They need money for their families now. This assumes that companies are not also struggling during the same recession. In a recession customers will spend less which means that businesses will make less and will have less to pay their workers with. I’m not going to even try to address your boogey man government funding of education— that somehow free education is going to instill a mad rush for worthless degrees. I’ve been down that road with you before, and have no interest in debating a lost cause. We’ll just have to agree to disagree. How is this a bogey man argument? It’s based on facts, the worst kind of argument. In 1967 college enrollment was just barely over 5 Million whereas now it’s well over 11 Million. (http://www.pewsocialtrends.org/files/2010/10/747-appendix-tables.pdf) I am allowed to cite Pew, aren’t I? The cost of gov’t-subsidized college has increased 1,100% since 1978 (http://www.bloomberg.com/news/2012-08-15/cost-of-college-degree-in-u-s-soars-12-fold-chart-of-the-day.html) and students owe a trillion dollars in student loans (http://www.finaid.org/loans/studentloandebtclock.phtml). Aside from this, most employers would be more likely to hire an applicant with experience than one with a degree (http://www.management-issues.com/news/2531/experience-more-important-than-a-degree/). I’m not sure what part of this is hysterical fear-mongering, but I apologize profusely. By the way, you stated in your argument that I said “ that most workers are not teenagers so therefore MW jobs are not meant for teenagers”. When di d I say that? I never said that. There was never a “denying of antecedent”. Your whole argument there seems based off misinterpreting what I said. Teenagers should certainly work in MW jobs. We both agree that teenagers need those jobs to start somewhere. 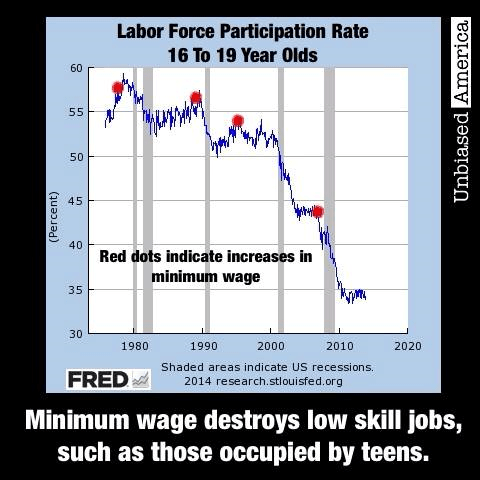 What I was indicating was the new reality that more MW workers are not teenagers, as shown in the numbers from the BLS. That’s just a reality that we are living with. Now, I can definitely see the concern that raising the MW may affect teenagers looking for a job, so I’m open to some suggestions that have been made to make the increase in MW age based, –the 20-16 year crowd can still get work for low wages if they choose. I’m happy to hear that, but such an exclusionary solution creates problems of its own. Some workers never try to work until after 20 for a variety of reasons (chose to focus on school instead, couldn’t work because they were in jail or the military, or a special educational program, invalid due to sickness, etc.) and try to enter the workplace for the first time at or after 20, and can’t enjoy the MW exemption that teenagers would. I would rather have freedom for everyone, not just a select few. That shouldn’t preclude us from at least keeping the floor of MW for the majority of MW workers tied to inflation—Just with inflation for heaven’s sake. Where does inflation come from? If not for the Federal Reserve pumping trillions of worthless bank notes into the economy, inflation would either be small or nonexistent. (http://images.tribe.net/tribe/upload/photo/013/e00/013e009e-f1eb-4021-8884-b13e7f477588) It is the government that is devaluing our money, and the statist solution is to inflate the price of labor as well. Is that really breaking the bank? For smaller businesses, quite possibly yes. Most high-profile supporters of raising the MW are either owners of huge businesses who can afford such an increase (and they know that their small competitors can’t) or union organizers (coincidentally, union dues are tied to workers’ wages). chart, You may notice that before every drop in the numbers there is a little shaded area marked “recession”. I don’t know if you noticed that or not, but recessions cause a lot more people to drop out the work force (due to scarcity of jobs) then small increases in the MW ever could. In fact let’s check that– I looked up those red dot dates in the FRED (Fed Reserve Economic Data) chart for MW increases and they happened to be 20 cents from 1975 to 76, 45 cents from 1989 to 90, 50 cents from 1995 to 1996, and a total of $1.40 through a series of increases between 2007 to 2009. Is that really your cause for the big plunges in teenager participation? Compared to major recessions causing unemployment to go over 8%? I think you’re confusing correlation with causality. Slight increases in MW may have contributed, but they were not THE cause. First, each of those red dots leads to a decline that begins before each recession, not during. There is only one point where the employment rate continues to surge after the red dot, and only one place where it remains steady for a few years after. Employment continued to surge in the late 1970s because runaway inflation kept the real value of the minimum wage low, even after the raise. And teen employment didn’t drop in the 90s because the US was riding the dot-com bubble. In either case, as soon as the next recession hit, teen numbers plummeted. Second, you’re assuming that those teenagers would have been unemployed during a recession no matter what the MW was. Ceteris paribus, meaning had the MW remained the same before/during recession, what evidence leads you to believe that their unemployment would have been similar or the same?